Aida Marianne Mollenkamp (born April 15, 1980)  is a chef, television personality, and food writer from Manhattan Beach, California. Manhattan Beach is a city in southwestern Los Angeles County, California, United States, on the Pacific coast south of El Segundo, and north of Hermosa Beach. Manhattan Beach is one of the three Beach Cities that make up the South Bay. Mira Costa High School in Manhattan Beach is ranked in the top 1% of high schools nationally. In 2017, Forbes ranked Manhattan Beach at #66 on its list of America's most expensive zip codes with a median home price of $3,150,204. According to a May 18, 2017 PropertyShark study the City of Manhattan Beach 90266 zip code ranked as the 32nd most expensive zip code in the United States. According to a December 2017 PropertyShark study the City of Manhattan Beach had the highest median price per square foot for residential properties of all 88 cities in L.A. County. Malibu had the second highest median price per foot at $933 per square foot and Beverly Hills was third at $839 per square foot. Chadwick School is a nonsectarian independent K-12 day school located on the Palos Verdes Peninsula in Los Angeles County, California, United States. Specifically it is located at the top of the neighborhood referred to as Academy Hill, which is bounded by a canyon, a precipice, Crenshaw Boulevard, and Palos Verdes Drive North. Mollenkamp attended the Cornell Hotel School and graduated with a B.S. in hospitality management from Cornell University. Following this, she worked in hospitality real estate consulting at Ernst & Young, then moved to Europe, living between Florence, Italy and Paris, France for two years. She attended culinary school and received a Grand Diplôme from Le Cordon Bleu in Paris in 2004. Over the years, she has worked at several restaurants and hotels in the United States (including Chez Melange, California Pizza Kitchen, and the Hotel Bel-Air, in Los Angeles, California). Following her return to the U.S. in 2005, Mollenkamp became an editor at the San Francisco, California-based CHOW.com online food magazine. Ernst & Young is a multinational professional services firm headquartered in London, England, United Kingdom. EY is one of the largest professional services firms in the world and is one of the "Big Four" accounting firms. Mollenkamp's first Food Network series, the interactive cooking program Ask Aida , began airing on August 2, 2008 and filmed three seasons. Her second show, FoodCrafters for Food Network's new sister network, Cooking Channel, debuted May 31, 2010. In FoodCrafters, she leaves the kitchen to uncover handmade food finds from around the nation. Food Network is an American pay television channel that is owned by Television Food Network, G.P., a joint venture and general partnership between Discovery, Inc. and Tribune Media. Despite this ownership structure, the channel is managed and operated as a division of Discovery Networks U.S. The channel airs both special and regular episodic programs about food and cooking. Ask Aida is an interactive cooking show on the Food Network hosted by Aida Mollenkamp. The show began airing on August 2, 2008. On Ask Aida, Noah Starr serves as the "tech guru" sorting through then asking the many culinary questions sent to Mollenkamp via email, text, phone calls and video. Also during each episode, Noah tries to "stump" Aida with a crazy ingredient or gadget. Each show also has an advertisement telling viewers how they can get a link to that episode's recipes via text message. FoodCrafters is a food travel show on the Cooking Channel hosted by Aida Mollenkamp. The show debuted on May 31, 2010 and is currently in its second season. It airs on Tuesday evenings on the Cooking Channel. FoodCrafters is produced for Cooking Channel by Citizen Pictures. The French are an ethnic group and nation who are identified with the country of France. This connection may be ethnic, legal, historical, or cultural. Sara Moulton is an American chef, cookbook author and television personality. In an article for The New York Times, Kim Severson described Moulton as "one of the nation’s most enduring recipe writers and cooking teachers...and a dean of food television and magazines." Wolfgang Johannes Puck is an Austrian-born American chef, restaurateur, and actor. Born in Austria, Puck moved to the United States at the age of 24. In 1973, Puck moved to Los Angeles, opening his first restaurant, Spago, in 1982. 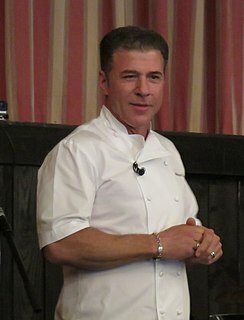 Michael Chiarello is an American celebrity chef specializing in Italian-influenced California cuisine. He hosts the cooking show, Easy Entertaining with Michael Chiarello, on the Food Network and hosts NapaStyle on the Fine Living Network. Chiarello owns a winery, Chiarello Family Vineyards, Bottega Ristorante and NapaStyle, a purveyor of food, cookware, and furniture in Yountville, and was a competitor on the fourth season of The Next Iron Chef, where he placed as the second runner up. In spring 2013, Michael opened Coqueta, a tapas restaurant on San Francisco's waterfront. Rick Bayless is an American chef and restaurateur who specializes in traditional Mexican cuisine with modern interpretations. He is widely known for his PBS series Mexico: One Plate at a Time. Katherine "Katie" Lee is an American cookbook author, television food critic, and novelist. Silvena Rowe is a British chef, food writer, television personality and restaurateur. Corinne Trang is an award-winning author of Asian-themed cookbooks. Susan Feniger is an American chef, restaurateur, cookbook author, and radio and TV personality. She is known for starring in the cooking show Too Hot Tamales on the Food Network and opening several influential restaurants in Los Angeles. She has been awarded a Lifetime Achievement Award by the California Restaurant Association. Melissa Donovan d'Arabian is an American chef and television show host. She won the fifth season of Food Network Star in 2009. Following her victory, she went on to host Ten Dollar Dinners on Food Network. Food Network Magazine is a monthly food entertainment magazine founded by Hearst Corporation and Scripps Networks Interactive based on the latter's popular television network Food Network. The magazine debuted in 2008, originally as two newsstand-only test issues to be followed by the first official issue in June 2009. As of 2010, it reaches 5 million readers with each issue with a 1.35 million circulation. It is now published 10 times a year. The magazine has its headquarters in New York City. Cindy Pawlcyn is an American chef best known for the restaurants she opened in the San Francisco Bay Area and the Napa Valley between 1983 and 2008. Pawlcyn was an early advocate for using local, sustainable meats and produce in her restaurants. In 2009, Pawlcyn appeared in the first season of Bravo’s "Top Chef: Masters." Nadia Giosia, known professionally as Nadia G, is a Canadian celebrity chef, comedian, and punk rock singer who transitioned her web cooking series into a TV cooking show. She was the host of Nadia G's Bitchin' Kitchen, which has appeared on Cooking Channel, Food Network Canada and Food Network UK. The show ran for three seasons on television, but started as a YouTube web-series. Starting July 14, 2014, she starred in a new series on Cooking Channel called Bite This with Nadia G. Giosia also launched a feminist rock, comedy, and food festival in Los Angeles in 2015 called Riot Grill and plays in punk rock band called The Menstruators. Chloe Kay Coscarelli is a vegan chef and author. She became the first vegan to win a culinary competition on television and was named to the 2017 Class of 30 Under 30 by Forbes. Mary Sue Milliken is an American chef, restaurateur, cookbook author, and radio and TV personality working mostly on Latin cuisine in the United States. Tanya Holland is an American professional chef, cookbook author, and owner of Brown Sugar Kitchen. Her first book, New Soul Cooking, was published by Stuart, Tabori & Chang in 2003. A second book, Brown Sugar Kitchen: New Style Down-Home Recipes from Sweet West Oakland with a foreword by Michael Chabon, was released in 2014 by Chronicle Books. Holland is a regular guest chef on NBC's Today Show and CBS's The Talk. She hosted the Food Network TV show "Melting Pot Soul Kitchen" from 2000-2003. Jeffrey Saad is an American chef, author, restaurant owner, television personality, and real estate broker from Chicago, Illinois. He is currently the host of United Tastes of America on the Cooking Channel and Estate Director with Compass in Beverly Hills. Marcela Luz Valladolid is an American chef and author. She was the host of the Food Network television series Mexican Made Easy, and a judge on the Food Network television series Best Baker in America. Sherry Yard is an American chef, restaurateur and cookbook author. ↑ "Aida Mollenkamp's official Facebook profile". Food Network. Retrieved 2010-06-06. 1 2 "Ask Aida: Mollenkamp Moms". Food Network. Retrieved 2010-06-06. 1 2 3 "Busy Weekend: Both 'Ask Aida' and 'Big Daddy's House' Premiere". TV Chefs Blog. 2008-08-01. Archived from the original on 2008-06-03. Retrieved 2009-08-18. ↑ "Ask Aida". Food Network. Archived from the original on 2 October 2009. Retrieved 2009-08-18. ↑ "FoodCrafters". Cooking Channel. Archived from the original on 30 May 2010. Retrieved 2010-06-06. ↑ "Aida Mollenkamp: Bio". Food Network. Retrieved 2009-08-18. ↑ "Aida Mollenkamp: Summary". TV.com. Retrieved 2009-08-18. ↑ "Dear Food Network Grilling: Grilling in Paradise". Archived from the original on 15 June 2010. Retrieved 2010-06-06.